There are three rooms which are licensed for civil ceremonies and are available for exclusive hire on any day of the week. On Saturdays the gardens are available for exclusive hire as the venue is closed to the public. Standing in a totally unique and picturesque setting within the heart of these romantic gardens you can exchange your wedding vows outdoors in this beautiful gazebo. Surrounded by lakes full of water lilies, weeping willows and the Monet style Japanese bridge, it recreates the scene from a Monet painting. 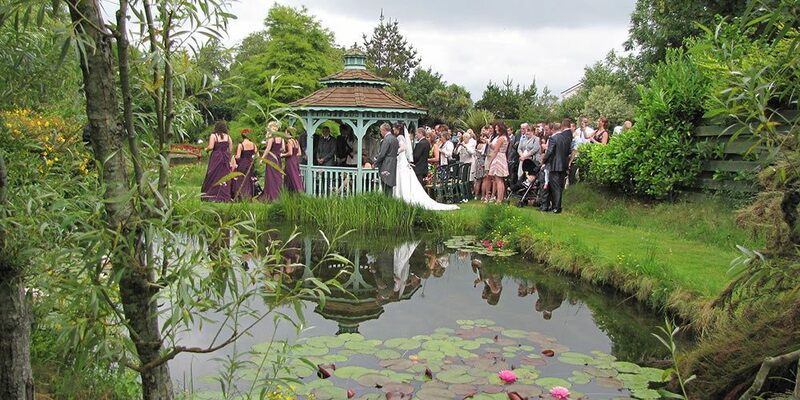 Brides can make the most stunning entrance, magically appearing from the Monet Bridge with her mirror image reflecting in the water, then walking through a six metre long willow arch and into the gazebo for the ceremony. This beautiful room has ivory pleated roof linings and a stunning view overlooking the water lilies and Imperial Gazebo. It is licensed for up to 60 guests for a ceremony. The Conservatory is only available on Saturdays. This is a more intimate room for your ceremony containing tropical plants, a cacti collection, and water lily ponds with the sound of water from a waterfall.